White turmeric, popularly known as Zedoary or Kentjur, is a perennial herb and member of the ginger family Zingiberaceae. The plant is native to India and Indonesia but now naturalized in other places including the United States and the state of Florida.Turmeric spreads via it's underground rhizome. White Turmeric is traditionally used to treat inflammation, pain, and a variety of skin ailments including wounds, as well as menstrual irregularities and ulcers. The main difference between yellow and white turmeric is the color and the ability to stain and it is slightly more bitter. It goes dormant in the colder months and returns twice as large each spring. The root can be harvested throughout the summer and fall. 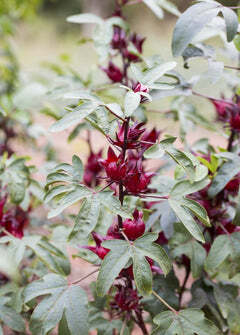 Large smooth and ribbed leaves are both ornamental and edible. Flowers are in bloom throughout the summer. Surprisingly easy and effortless to grow, Turmeric is well-suited for container gardening. It is often grown as an annual in pots or in the ground.